CARTER LAKE, Iowa (AP) — Some 150 years after suffering the loss of its homeland at the hands of the U.S. government, the Ponca Tribe of Nebraska is celebrating a triumph with the opening of a casino intended to secure a stream of revenue for the long-struggling tribe. The only thing standing in its way? An effort by governments in Iowa and Nebraska that seeks to strip it of the casino. “It’s the same fight, all these years after it began,” said Ponca Tribal Chairman Larry Wright. The $10 million Prairie Flower Casino opened in November with 200 slot-style machines after the National Indian Gaming Commission approved the tribe’s casino license a year earlier, some 10 years after the tribe began its effort to open the casino. It’s far from a novelty in the area: Three much larger casinos are just a few miles away, also in western Iowa. Yet the casino’s location is central to the opposition to it, including lawsuits from the city of Council Bluffs, Iowa, and the states of Iowa and Nebraska. Unlike most other tribal casinos, the Prairie Flower wasn’t built on a reservation. The Ponca Tribe — forced in the 1870s by the U.S. government to leave its homeland along the Missouri River in Nebraska River — has no reservation. The U.S. government terminated the tribe in the 1960s and took its remaining land as part of a policy that sought to abolish reservations and assimilate Native Americans into mainstream American society. The tribe regained its federal recognition in 1990, and most of its 4,500 members are spread over 15 counties in Iowa, Nebraska and South Dakota. Its casino sits on a 5-acre (2-hectare) lot that the tribe bought 20 years ago in Carter Lake, the only Iowa city on the western side of the Missouri River, which otherwise separates Nebraska and Iowa. Carter Lake had originally been on the east side of the river, but thanks to shifting and flooding in the late 1800s, it’s now surrounded by the city of Omaha — the largest city in Nebraska, whose constitution expressly forbids casinos. The Prairie Flower is essentially in the heart of Omaha, just blocks from the city’s downtown and a mile (1.6 kilometers) from its airport. The lawsuits fault the National Indian Gaming Commission’s decision to license the Prairie Flower, saying the tribe misrepresented its intentions when it initially announced plans for a health center on the lot. 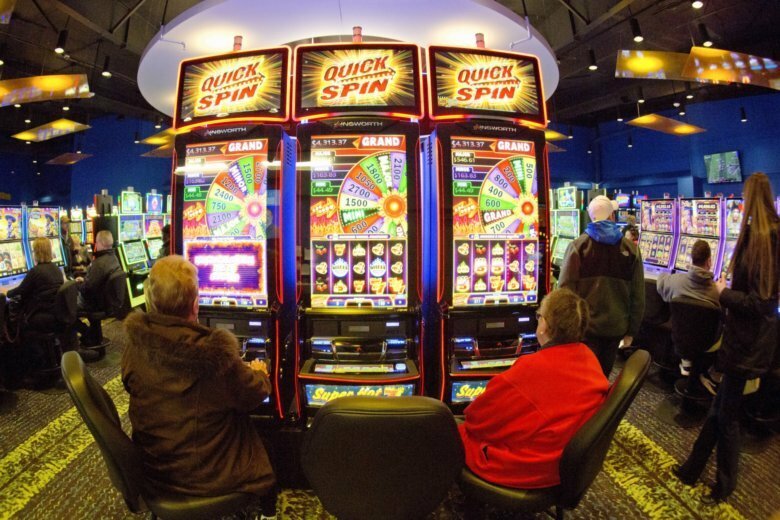 But the underlying opposition in Iowa isn’t hard to track: It comes down to money and a perceived tug-of-war for patrons such as Helen Syfie, 73, of Omaha, who recently stopped in to play the slots at the Prairie Flower. She said she “couldn’t wait” for the Carter Lake casino to open, but she also said she’ll still cross the river to go to the Council Bluffs casinos. State and local officials don’t want to give up any share of the millions in taxes, fees and endowment funds Council Bluffs’ three casinos produce. In 2017, that public money came to nearly $95 million, according to the Iowa Racing and Gaming Commission, and a large chunk comes from Nebraska residents. A 2013 study ordered by the commission found Nebraska residents spent nearly $327 million at Iowa casinos, one-quarter of revenues for the state. Pat Loontjer, director of anti-gambling nonprofit Gambling With The Good Life, is among those in Omaha fighting to see the Ponca casino shut down. “The cost to the state will be in the millions when you consider the bankruptcies, embezzlements, increased crime and families torn apart by gambling addiction,” she said. Wright, the tribe chairman, noted that about 80 of the casino’s 100 employees are not tribe members. He also said the tribe is paying $750,000 annually to Carter Lake to offset any safety and infrastructure costs to the city. Syfie said she hopes the tribe is allowed to keep the casino. The mass exodus from Greater Washington continues. And it got worse last year.